One of the smartphone models available in the market today with a large battery capacity is the #Samsung Galaxy #Note4. This device sports a 3220 mAh battery that is able to provide up to 28 hours of talk time, 11 hours of web browsing, and 17 hours of video playback on a single charge. This device also has one feature that everyone loves and that is its fast charging capability which charges the battery to 50 percent capacity in just 30 minutes. There are however instances when some charging problems can occur and this is what some of our readers are facing. In this latest installment of our focused troubleshooting series we will tackle the Galaxy Note 4 stopped charging issue and other related problems. If you own a Samsung Galaxy Note 4 or any other Android device for that matter then feel free to contact us using this form. We will be more than happy to assist you with any concern that you may have with your device. This is a free service we are offering with no strings attached. We however ask that when you do contact us try to be as detailed as possible so that an accurate assessment can be made and the correct solution can be given. Problem: My phone was charging just fine and all of a sudden it just stopped while still plugged in. I moved the cord a bit and it started back up. It happened a few more times until it just wouldn’t work. I switched out the battery with my brothers note 4 and I tried plugging it back in. The charging icon appears. The led didn’t turn on though. The charging icon disappeared then the phone started vibrating as if I was relieving a call almost. I had to unplug the phone to turn it on. When I plugged it in, no more vibrating or charging icon happened. If I pull out the battery and put it back in it does the same thing over again. I’ve only had the phone since August. Solution: If your phone intermittently charges when it is moved then there are four reasons why this is happening. First, the charging port of your phone may be dirty. Check the port for any signs of dirt or debris as this usually interferes with the charging process. If necessary, clean the port using a can of compressed air or a cotton bud dipped in alcohol. Second, the charging cord may be defective. This is usually the case when the cord is constantly bent or coiled as some wire inside of it may get cut. The best way to check if this is the case is to replace the charging cord and see if your phone charges normally. Third, a software glitch may be causing this issue. Try to wipe the cache partition of your phone first then check if the issue still occurs. If it does then start your phone in Safe Mode. If your phone can charge normally in this mode then a third party app you installed in your phone may be causing the problem. Find out what app this is and uninstall it. One last software troubleshooting procedure you can do if the above steps fail is to perform a factory reset. Make sure to backup your phone data before proceeding. 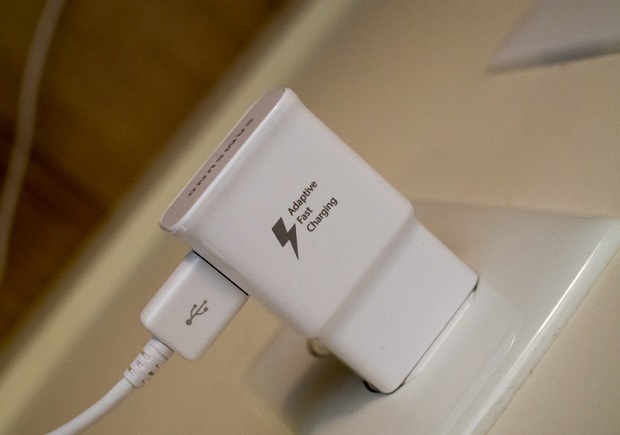 Last but not the least, your phone charging port may be loose or defective. If this is the case then I suggest you bring your phone to an authorized service center and have it checked. Problem: I have gone through several chargers for this phone. They all work or a few weeks but suddenly stop working. The phone won’t even register that they are plugged in. The first couple chargers I had were the fast chargers by Samsung. After both of those have burned up, I have gone to the regular chargers (which do charge the phone really slow) but they go out after a short period of time using them as well. Could this be the cause of my phone? Or do chargers suddenly have a really short life expectancy now? Solution: Chargers don’t normally get damaged when charging a phone. Have you tried checking if the chargers that don’t work anymore with your phone work on other devices? If they do then the issue may be caused by some other factor. Try using a different charging cable and see if the problem disappears. You should also check the phone charging port if it has any signs of dirt or debris. If needed, clean the port using a can of compressed air or cotton bud dipped in alcohol. On the software side of things I recommend you immediately jump to doing a factory reset. Make sure to backup your phone data before performing this procedure. If the above troubleshooting steps fail then you should try using a new battery and see if the issue gets resolved. If not then I suggest you bring your phone to an authorized service center as this may already be a hardware related issue. Problem: Hi there, I’ve been experiencing issues since I had my phone (exactly 1 year to date) I’ve always had issues with charging. The OEM usb/charging block worked for a good month or two and then eventually became difficult to hold a charge, I’d have to wiggle it to get to the right spot(charger is stationary so no wear & tear could’ve been done) until eventually just stopped working which I bought another usb and worked fine up to the point where it didn’t work with any charger and I had to replace the phone. Came back and again oem worked for a month then stopped and went back to 3rd party chargers however this time the usb’s i’d buy It seems like my phone was very picky towards them as it would work with only a few. I work at an electronic store so it would always be good branded cords but was strange how the micro usb I’d buy would be hit or miss and when It did work again- would only work for couple months. Now warranty is over and I feel like swapping out the charger port on my own but before I do so any advice you can give me? Also by the way every USB that did not work with my phone including oem worked with every other phone that tried it so the problem was definitely my phone. Solution: I suggest you try checking the USB cord that doesn’t work on your phone on other devices and see if it works. If it doesn’t work then the cords may be damaged due to usage. This usually happens if the cords are bent or coiled constantly. If however the cords do work on other devices then the problem may be with your phone charging port. Check first if cleaning the port resolves the problem. If it doesn’t then you may need to replace the charging port assembly. Problem: My phone doesn’t recharge faster, the charge is working, but maybe it is from the phone how i can resolve this problem please it takes a lot of time to be recharged. Solution: Try to check first if the fast charging option has been enabled in your phone settings. You should also make sure that you are using the Samsung Adaptive Fast Charge wall charger with its accompanying USB cable to charge your phone. If your phone still charges slowly then try using a different USB cable then a different fast charger if the problem persists. Problem: The fast charging option in settings under battery is grayed out and so I cannot select it. I know I’ve used it before. How do I get it back. Help. Thank you. You do good work. Solution: This option will be greyed out if you check it while your phone is connected to the fast charger. Disconnect your phone from the charger first then check if the setting is still greyed out. You should also make sure that the power saving mode of your phone is switched of. i have a 1 year samsung note 4 and phone is charging very slowly and it takes a minimum of 7 hours to get complete 100% charged. i have enabled fast charging too and tried with many authorised samsung chargers and usb cables, but still facing the same issue. now the phone is not connecting with laptops for http://FTP.i have tried every possible way but it’s still showing charging .